40 ct. Vintage Pearled Barley, Various silks (1 over 2). And then Wednesday I saw Glenna's pictures of the Carriage House Samplings trunk show at In Stitches. And I decided to start something I've been wanting to start for a long time. Or actually restart because I started it a couple years ago, but then decided not to stitch it. The project is Shores of Hawk Run Hollow. I was Hawk Run Hollowed out for approximately a week and then it was time to stitch another one! 40 ct. Summer Khaki, over-dyed with Tan Rit Dye, NPI silks (1 over 2). After working on SoHRH a little bit I decided to get Paradise Lost back out. I really want to get it finished up, so I'm going to try to concentrate on it for awhile before getting back to my other bigger samplers. 40 ct. Vintage Light Examplar, NPI and Gloriana silks (1 over 2). Thank you all for your kind comments on my Anniversaries of the Heart project. I will be getting back to it also. I would love to finish up the first two houses before 3rd comes out (possibly at the end of the month??). Write soon! Yay, Nicole! I felt exactly the same way when I saw all those CHS samplers: now I want to get mine out and do a restart (mine being Houses and Christmas). Loving your SW and of course, PL! Yeay Nicole!! I'm glad you're restarting Shores. I love all the HRH samplers but I really enjoyed working on this one--love the colors in it. Your Sarah looks great, and Paradise--love love love it! As always everything is just so pretty. I am going to put in some time on Paradise Lost this weekend and try to get a piece finished so I can send a package to Deb for finishing. Wow, lovely big samplers! I have two out of the three but yet to start on them! Wonderful! They are all precious! Ooooh, another Shores stitcher! Hooray! There are a few of us at the moment :D Love your Sarah Woodham start too - I may have to stitch that one for the flower border alone! And Paradise looks just great too! What a great collection of WIPs! Love them all! I know exactly how you feel about HRH. I'm just getting to the end of Villages and Autumn is really calling my name to start! 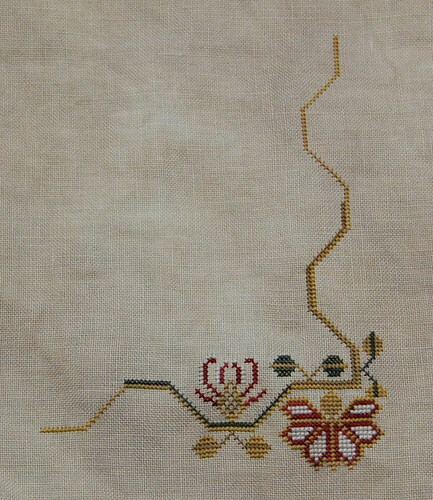 Love all your samplers, beautiful stitching! I'm so glad you're restarting Shores. I still need to get back to block 2. But I love the colors in it. And your PL is looking amazing!! Great idea on overdying the summer khaki fabric for your shores piece. I have this one kitted with a VERY dark piece of fabric and I think that is why I have never started it. Hmmm, may have to pull it out soon but not until I put a good dent in my Paradise Lost. Love the flower on Sarah Woodham! Wonderful start on Shores and progress on PL too. Those colors are so vibrant!! You've really got some big projects going! All ones that are on my ever growing wish list, so it will be fun to follow your progress! Oh, my gosh, Nicole, I've been overwhelmed into speechlessness by your awesome "escapades" lately!! I've been keeping your blog open in a tab so that I can check back and admire your stitching, lol! I was so happy to see your finished JB I finally got my linen for that one and am sort of itching to stitch it--but I already have so many WiPs, and I'm not sure I wanna stitch more "Winter" right now! Then, a "Start" soon followed! Man, do I want to do Snow Garden on some nice warm Linen like that--Beautiful! I hope you do keep working on that one so I can admire it!! And, finally even a start on "Shores". I've been gravitating towards shores WiPs lately; must be my wishes for warmer weather! All I can say is, YGG! The next best thing to having it myself is getting to see yours (or, seeing yours might be better because you get your wips done so quickly)! 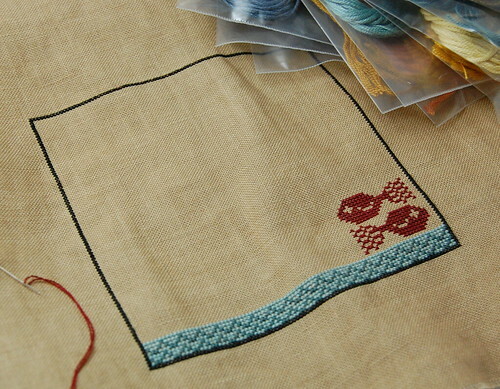 What a delightful blog, your stitching is beautiful and your framing is great. Am I mistaken in thinking you don't use glass in your frames? I have numerous samplers to frame and don't fancy getting a second mortgage to pay for it. :o) Thank you for sharing. Makes me feel better that your PL is not finished! LOL! You have finished what I don't have finished so it's fun to see your cute animals that I have to look forward to! Enjoy the journey! I am! HUGS! Good Progress...both of them are so very pretty. I'll try to stay back from the monitor so as not to drool on your Shorees as I watch your progress..and PL! Love the progress on your other two pieces too. All three are such great projects! A lovely assortment of WIPs. What a wonderful show of WIPs - they're all beautiful! Pleased as punch to see you working on Sarah -- and Sarah would be thrilled to know so many people are admiring her work. Remember, she was only NINE when she stitched that sampler. What an accomplishment. You go girl!